I suppose I’ll have to go into more detail other than: I was extremely disappointed with this book. The author of Summer of the Monkeys also wrote Where the Red Fern Grows, which is probably one of my all time favorite books. Where the Red Fern Grows was absolutely outstanding, so to read this and dislike the book so much…simply disappointing. I think there was a poor choice of descriptive words. I suppose it was descriptive enough, just done poorly and very repetitive. It seemed to overuse several words way too many times. The book also became very predictable. The same thing happened again and again, until eventually things just worked out. Just like that. I also think the intelligence of the monkeys was over exaggerated by far. I’m sure they’re very smart animals, they’re human like of course. But good God. Too much. The thing that bothered me most was the way the characters were written, not age appropriate. The main character, Jay Berry, was a fourteen year old boy. He acted three or four years younger. His little sister would sometimes seem too mature, and other times act five instead of nine. Now I’ll admit, I’m a bit of a book snob (much like my mother). But I have good reason to be so snobby about this book, in my own opinion. Of course I tried to keep in mind that the story took place in the late 1800’s. Now onto the ending. The only reason I liked the ending is because it was finally over and done with. But I think it ended too perfectly. It was a bit unrealistic, the way things turned out. There were no downsides. Everyone got what they wanted. Which, let's be honest, never really happens. Overall, I did not like the way it was written and would certainly not recommend it to anybody. Ah... just the sort of post that I like! Someone who can tell it like it is, is very much appreciated in the book blog world. Clearly, you are your mother's daughter - ha! Quite sincerely, you've done an excellent job with this post. I look forward to reading more from you. Second, I also LOVED "Where the Red Fern Grows"!!!! My fifth grade teacher would read it aloud to us, one chapter at a time, which drove me INSANE! I had to go to the library, check out the book, and read ahead completely because I could not wait until the ending. And thank goodness I did because I totally cried at the end at home, which saved me the embarrassment of crying in front of my fellow 5th graders. Talk about mortifying at 10 years old! 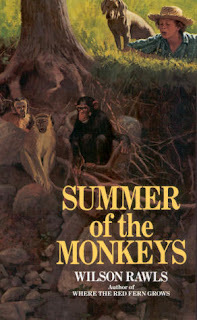 I was a 5th grade teacher for a few years, so I've read a lot of young adult literature, but not "Summer of the Monkeys." After your review, I will make sure to never read it. Have you read the City of Ember series? My fifth graders a few years ago begged me to read them, and it was a really great series! If you haven't read them, you may want to at least check out the synopsis of the first book. They were great! Nothing like a 12-year-old book snob! ;) Good Review! Oh, I love Where the Red Fern Grows! I have never read Summer of the Monkeys, and now I know I'm not missing much. :) Thanks for the review! Great review, Avery!! My son also is just starting reviewing books. He is 10 and loves to read! We are still working on a format..as he doesn't like to write as much. I loved you honest review...and love a fellow book snob. :-) I look forward to reading more of your reviews.